New Milford High School on the first day of classes, the start of the facility's 16th school year in August. 2015. 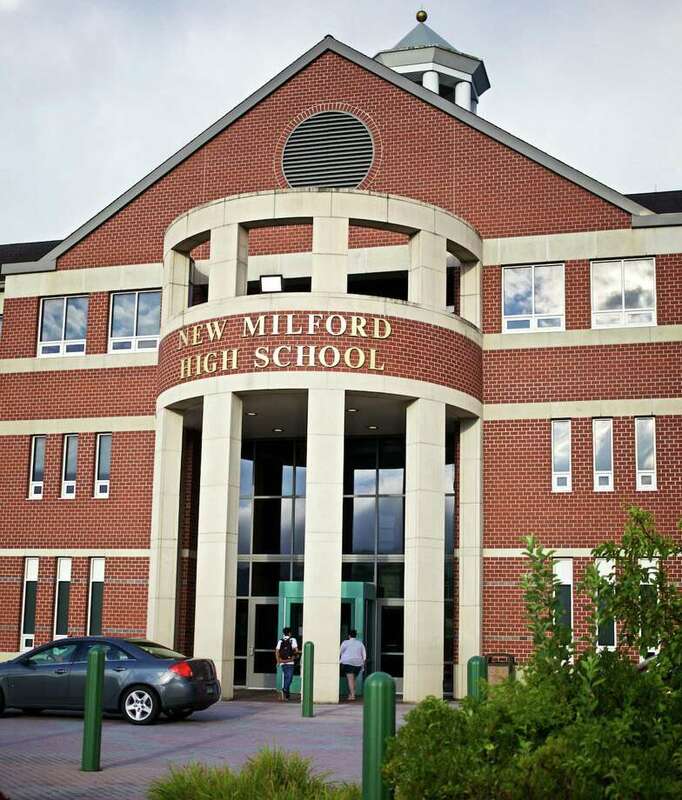 NEW MILFORD — The school board is asking the Town Council to include the high school and Sarah Noble Intermediate School roofs in the upcoming borrowing cycle. Sarah Noble’s roof will be a standard replacement while the high school roof has several options on what should go in its place. It can either have new asphalt shingles put on, continuing with its current appearance, or it can switch to metal with either steel or aluminum panels, which was the intended design for the school. Officials will also have to decide if they want to add solar panels if they go with a metal roof. Bids ranged between $3.1 million and $4.8 million for the shingles and metal roofs, with several prices available for each option. The decision will ultimately be up to Town Council, but the school board said the metal roof is the best option. “The original design was metal and I think we’re paying for that mistake in 1999,” said board member Brian McCauley. Board member Eileen Monaghan, who also served on the building committee when the high school was built, said the project came in on time and under budget, which wouldn’t have happened if they did the metal roof. Shingles are continually blown off the school due to the topography and how the wind flows, resulting in thousands of dollars to replace them each year. The macroburst in May damaged the roof so badly it was leaking, prompting officials to patch it for $200,000. Those repairs are now complete as officials craft the permanent replacement plan. “We’re all buttoned up for the winter,” interim Superintendent Stephen Tracy said. Board members were divided on whether they should have solar panels, but most agreed they should make the roof solar ready so that they don’t close themselves off to the option later. By making the roof able to accommodate solar panels by adding the needed hinges now, it will be $6,500 more than just a regular metal roof. If that work were to be done years later, it would cost about $500,000 because each roof panel would have to be removed and reinstalled with the fixtures for the panels. Facilities Director Kevin Munrett said it will take about 10 years for the district to see the payback from the solar panels but then they can expect $92,000 to $93,000 in energy savings annually. Some board members questioned those figures though. Board member Angela Chastain said the high school is one of the first things seen upon entering town and she didn’t want solar panels all over the high school. Board member Joseph Failla said he supports solar and would be fine with panels on the lawn, but doubted the high school would benefit from panels on the roof based on the age and design of the building. Given his concerns, he still said they should go with the option to be solar ready. Board member Wendy Faulenbach also reminded the board that the Sarah Noble roof has been a long-term priority and shouldn’t be overshadowed by the high school.